Well I have had a busy week or so. The past weekend was busy with viewings and parental visits. I took the girls to a ‘paint-your-own-pottery’ place on Saturday as we needed to be out of the house and it was peeing down with rain. While I was painting my Emma Bridgewater-esque Butter Dish (I know, ideas of grandeur) my phone rang, it was my Dad. 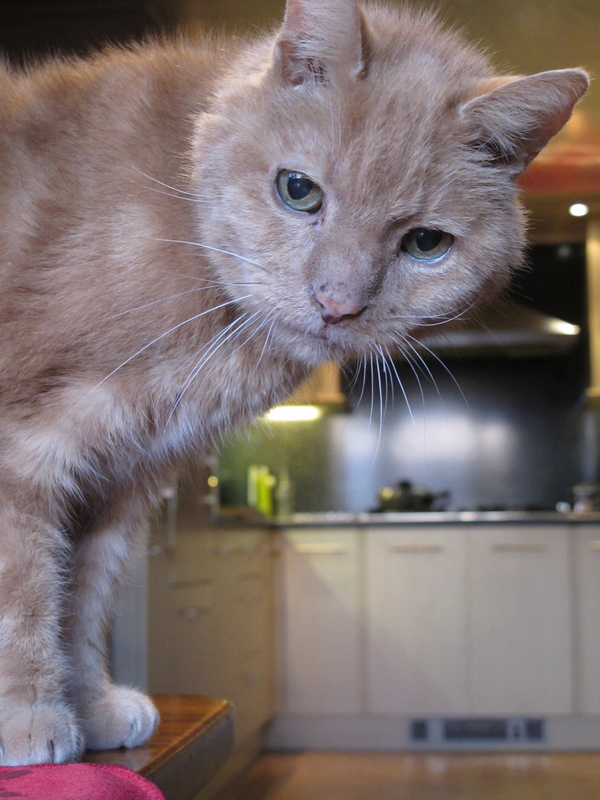 I had not received a text from my Mum to tell me that my old cat, Oscar had died on Friday, of kidney failure. He was 21, the most gorgeous old gentleman, that I was so honoured to have owned. (He had stayed living at my parents when I left home). My Dad was upset and I sat there and cried… in the middle of the pottery. The butter dish probably has Oscar tears on it’s design, but that will make it all the more lovely. RIP Osc…. you were an amazingly beautiful and kind cat. I am so lucky to have had you. The feedback from the viewings was – 1 wants to make an offer, but needs one on their house first, the other two said the bedrooms were too small. Pfft. READ THE BLOODY DETAILS ALREADY! Anyway, have not found anything to buy yet so just as well. Sunday morning was glorious so we went on a long walk from Snelsmore Common to The Black Bird, at Bagnor (home of the famous Watermill Theatre.) I partook of a half pint of cloudy cider that was 15%! The walk home was very jolly! On Monday – breaking news was that Mrs Merrick is back at work! Yey! She looks SO much better and all abnormalities have vanished! In other breaking news…. I have my official sponsor page now for the Moonwalk – a marathon you walk in the middle of the night whilst wearing a bra! http://www.walkthewalkfundraising.org/brockleyladies. I am walking with a friend from Twitter and her daughters to raise money for Breast Cancer Awareness. Now, I don’t do this often (ask for charity donations, or wander round London in a bra) but it would be great if you could donate a little something and in return I will show you my bra…. (bribery works well I always find). And it’s not often never that I get to trade of my feminine charms! ha ha! So next job is to get a funky bra and decorate it (incorporating it into a boiler suit and food rucksack is an option). I made a canvas of this picture I took at Christmas of my old boy, for my parents. (well, *I* didn’t, Photobox did) so hopefully that will turn out ok.
Now I really must start training…. Posted in Diary Entry and tagged Pottery. Bookmark the permalink.